Get the Family together or go out on a date night to our local OC Parks for some fun under the stars with a movie! The County of Orange and OC Parks are pleased to present the first Sunset Cinema film series, featuring 12 free movies at Carbon Canyon Regional Park, Craig Regional Park, Salt Creek Beach, Mason Regional Park, Laguna Niguel Regional Park, and Yorba Regional Park. Sunset Cinema will screen recent favorite and popular classic films June 3 – August 18 around sunset. 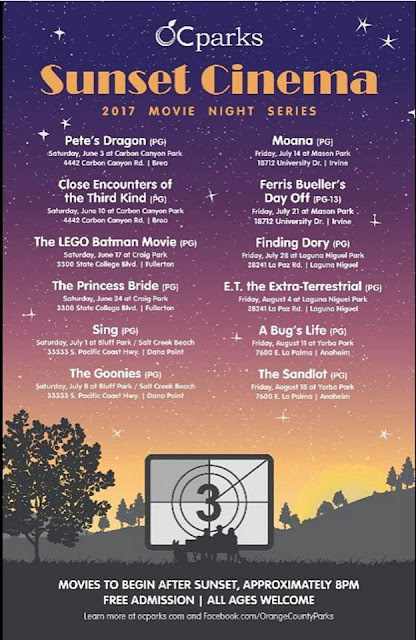 The first free movie night of the series kicks off on Saturday, June 3 at Carbon Canyon Regional Park in Brea with a screening of Disney’s Pete’s Dragon. Look out for U.F.O.’s and catch the sci-fi film Close Encounters of the Third Kind on Saturday, June 10 at Carbon Canyon Regional Park. Head over to Craig Regional Park in Fullerton on Saturday, June 17 as the series continues with The LEGO Batman Movie. Then travel back in time and catch fan-favorite The Princess Bride at Craig Regional Park on Saturday, June 24. On Saturday, July 1, don’t miss the animated comedy Sing at Salt Creek Beach. The following week, sit ocean-side at Salt Creek Beach and look out for treasure hunters in The Goonies on Saturday, July 8. Sunset Cinema then moves to Mason Regional Park in Irvine and OC Parks invites families to take a virtual trip across the ocean to Ancient Polynesia with Moana on Friday, July 14. Then invite all your friends on Friday, July 21 to catch the beloved film, Ferris Bueller’s Day Off at Mason Regional Park. Gather the family for the screening of Finding Dory at Laguna Niguel Regional Park on Friday, July 28. Friday, August 4 welcomes the 80s hit E.T. the Extra-Terrestrial at Laguna Niguel Regional Park. OC Parks Sunset Cinema series continues at Yorba Regional Park in Anaheim with the animated tale of a misfit ant and his circus troupe of friends in A Bug’s Life on Friday, August 11. Wrap up the summer with family and friends on August 18 at Yorba Regional Park with the 1993 American coming-of-age film, The Sandlot. Pack a picnic, blankets, and beach chairs and head to OC Parks Sunset Cinema and enjoy recent popular flicks and introduce the young ones in your life to beloved classics. All movies are free to attend, with free parking beginning at 6 p.m. and show times starting around 8 p.m. after the sun has set. Food trucks will be serving on-site. For more information visit ocparks.com. There are a lot of our favoites on this list!! We can not wait to head out to OC Parks! Hope you get to catch a flick too!